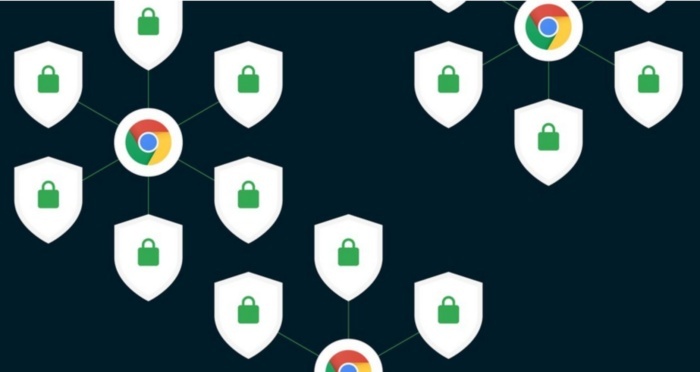 There has been a breach in Google Chrome's security. Chrome recently issued a zero-day fix because there has been a security flaw in the browser. They are urging users to update immediately. The update is for Mac, PC, and Chrome computers, both desktop and laptop. According to a report by Lifehacker, your browser should update automatically, however, for many users who have the feature activated, this was not the case. There are also many users who do not have the feature activated, and they should manually check their browser for updates. Double check that you are running version 72.0.3626.121 -- if not, OCN and Google advise updating. It should look like this. 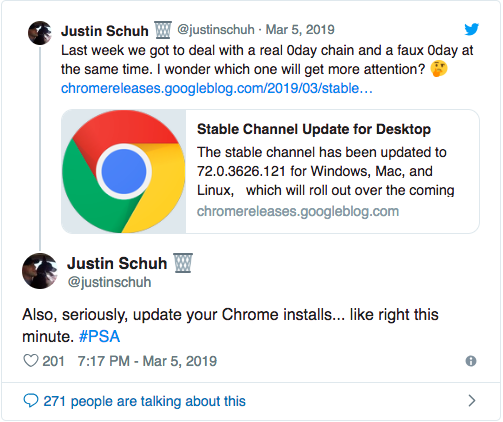 Justin Schuh, Chrome's lead of security and desktop engineering, took to Twitter to issue the warning. He is urging all users to update "like right this minute." I would listen to him. The security flaw is the zero-day security vulnerability, CVE-2019-5786 -- this bug causes software to go wrong and reduces computer security (which is, of course, very important). A zero-day fix simply means that they have zero days to fix the issue, and it needs to be resolved as quickly as possible. According to a report by Forbes, the flaw deals with memory management in Chrome's FileReader (the direct issue), which is an API that allows web apps to read the files on a user's computer. The "bad guys" were able to access the files on the user's computer while the security flaw was active. An anonymous IT personnel informed OCN, "With the vulnerability active, someone can exploit that vulnerability and make your computer run any program they want, even one that isn't on your computer." Basically, someone can hack your computer, mess with and read your files, and run any program, including a virus, on your computer. They can access any personal information of yours including bank account, address, phone numbers, and place of work. There are two possible ways to update. Simply type in chrome://setting/help. This will take you to the "About Google Chrome" section and it should automatically update your computer. You can check out the official release here! Do you have Google Chrome on your computer? Have you updated your computer already? Tell us in the comments! Life got you down? The FDA has approved a new antidepressant for the first time in 30 years. Read all about it here!